These are probably my most requested treat and a favorite Pampered Chef recipe. I made them today for my friend Lacee. She is leaving on a mission soon and I made them for her open house tonight. 1 pint small strawberries, sliced or 1 pint whole raspberries or both! 1 Heat oven to 325. Spray cups of mini muffin pan with Pam with flour (the one labeled for baking). Prepare brownie mix according to directions for cake like brownies. Using small scoop, fill each cup 2/3 full. Bake 14 minutes or until edges are set (do not overbake!). Remove pan to cooling rack. Immediately press tops of brownies with tart shaper to form cups. Cool in pan 15 minutes. Loosen edges and gently remove brownies from pan. Cool completely. Repeat with remaining batter. 2 Microwave white chocolate and milk on high 1 minute then stir until smooth. Cool slightly. Combine cream cheese and powdered sugar and mix well. Gradually stir in white chocolate until smooth. Fold in Cool Whip. 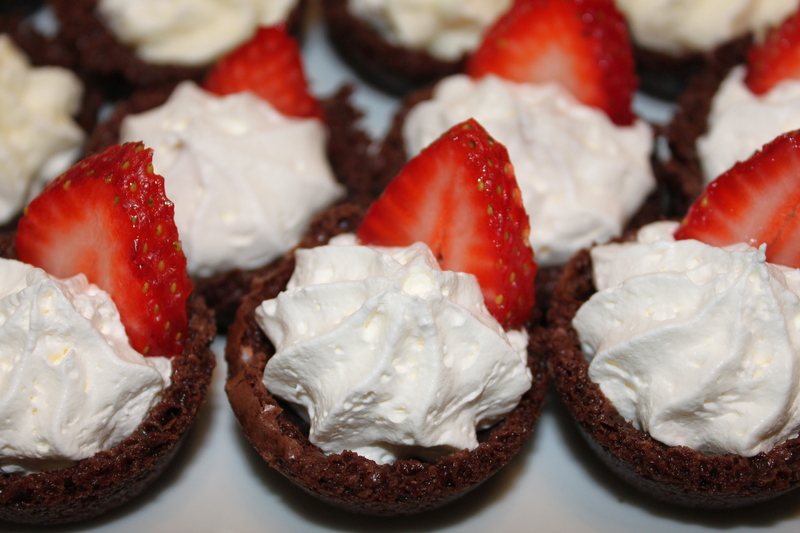 Pipe mixture into cooled brownie cups with Easy Accent Decorator. Place 1 strawberry slice into each cup or one whole raspberry into each cup. OR you can skip most of step #2 and just fill these with Cool Whip which is what I usually do. It’s faster and easier and everybody loves them no matter what’s in the middle! I have made these for years… Love them! But sometimes the brownies won’t come out of the pan in one piece… any hints??? Yes, here are two tips for you, I’ve had the same problem on occasion myself until I started using the Pam for Baking (the one that has flour in it) and also I am really careful to not overfill the cups, those two things almost always help the cups to just pop out of the pan, let me know if that helps at all! Thanks for the quick reply. I am actually trying something different this weekend: put mini cupcake liners in the pan… melt choc chips with a little shortening and a little butter in the microwave… using a small brush, “paint” the cup with the mixture, refrigerate for 15 minutes… “paint” a second layer. Put in freezer for 10 minutes. Take out and the paper peels right off leaving a choc cup. This way I avoid the stuck brownies AND I can fill them the night before without them getting soggy. That being said, I still want to do the original method next time, so MANY thanks!